This page hopes to explain to you 'What is Microsoft Access' in simple terms. Microsoft Access has been around for some time, yet people often still ask me what is Microsoft Access and what does it do? Microsoft Access is a part of the Microsoft Office Suite. It does not come with all versions of Microsoft Office, so if you specifically want Microsoft Access make sure the office suite you are purchasing has it. Microsoft Access has the look and feel of other Microsoft Office products, including its layout and navigational aspects. That is where the similarity ends. Microsoft® Access is a database and, more specifically, a relational database. This will be explained in more detail later. Access has an .mdb extension by default, whereas Microsoft® Word has the .doc extension. Although this has changed in Access 2007 where the extension is now an accdb extension. Early versions of Access cannot read accdb extensions but Microsoft Access 2007 can read and change earlier versions of Access. The above is a bried overview of what is Microsoft Access. Now lets look at it in a bit more detail. The following gives a quick overview of each component. The tables are the backbone and the storage container of the data entered into the database. If the tables are not set up correctly, with the correct relationships, then the database may be slow, give you the wrong results or not react the way you expect. So, take a bit of time when setting up your tables. Queries, forms, etc. are usually based on a table. The tables that contain data look a bit like a table in Microsoft® Word or a Microsoft® Excel Spreadsheet, when opened. They have columns and rows as does a table in Microsoft® Word and an Excel worksheet. Each of the columns will have a field name at the top and each of the rows will represent a record. Are the means of manipulating the data to display in a form or a report. Queries can sort, calculate, group, filter, join tables, update data, delete data, etc. Their power is immense. The Microsoft® Access database query language is SQL (Structured Query Language). The need to know SQL is not required in the early stages of learning Access. Microsoft® Access writes the SQL for you, after you tell it what you want, in the Design view of the queries window. Forms are the primary interface through which the users of the database enter data. The person who enters the data will interact with forms regularly. The programmer can set the forms to show only the data required. By using queries, properties, macros and VBA (Visual Basic for Applications), the ability to add, edit and delete data can also be set. Forms can be set up and developed to reflect the use they will be required for. Reports are the results of the manipulation of the data you have entered into the database. Unlike forms, they cannot be edited. Reports are intended to be used to output data to another device or application, i.e. printer, fax, Microsoft® Word or Microsoft® Excel. Macros are an automatic way for Access to carry out a series of actions for the database. Access gives you a selection of actions that are carried out in the order you enter. Macros can open forms; run queries, change values of a field, run other Macros, etc. the list is almost endless. Modules are the basis of the programming language that supports Microsoft® Access, The module window is where you can write and store Visual Basic for Applications (VBA). Advanced users of Microsoft® Access tend to use VBA instead of Macros. If you would like to learn VBA, I have a simple step by step lessons. All of the above components are persistent; this means that changes are saved when you move from one component to another, not when the database is closed, as in a Microsoft® Word Document. I hope the above give you a bit of an idea of what is Microsoft Access and what it includes. The total size of a database file (.MDB) is limited only by the storage capacity of your PC (Microsoft® quote the maximum database size of 2 Gigabyte (2000 Megabytes)). These figures are for pre 2007 versions of Microsoft Access. Maximum size of a form or report 22"
Data is broken down to the smallest useable bit. For example a persons name would be broken down into 4 sperate sections title, first name, middle name and last name. Information about when a book was borrowed and by whom. The database would grow very big, very quickly, causing it to run slower. Table Three (tblLoan) would contain information about the borrowing of a book. The next step is to list all the facts you think are required for each of these tables underneath them. I have included the examples below for each of the tables for the library database. The primary key and foreign key fields will be explained a bit later. The information is only recorded once, i.e. we do not include all the information about the customer in the tblLoan table. An important part of determining the fields for each table is deciding which field (if any) is suitable as the primary key. Also, if the information contained in the Primary Key is likely to be altered, then it is best to avoid this field as well. If a unique identifier cannot be identified (which is more than likely), you can add a field, which will automatically increase sequentially by one, thus providing the record with a unique identifier. 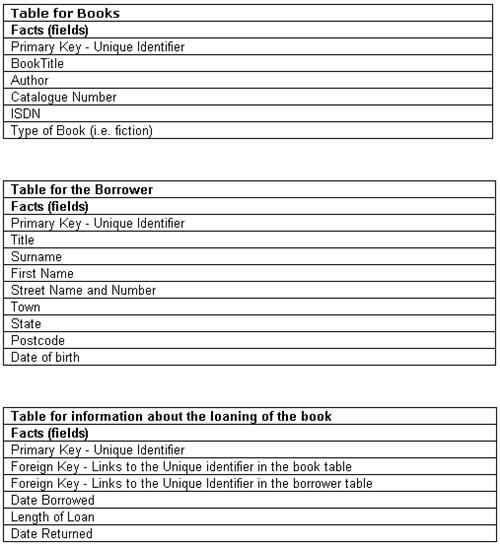 The ‘Book’ table is linked to the ‘Loan’ table with BookID and BookFK fields. These fields are known as foreign keys (FK). Note: that only the ID field is kept in the loan table, no other information is needed from the borrower table or the book table. By setting up relationships between the tables, Microsoft Access knows which foreign key belongs to which primary key (unique identifier) and can pull the information from the relevant tables when needed. So it some it all up. What is Microsoft Access, well it is a relational database found in the Microsoft Office suite. If you are still confused about 'What is Microsoft Access' then try: What is Microsoft Access at Wikipedia. Most of this information on 'What is Microsoft Access' has been taken from my Tutorial on Microsoft Access. If you would like a free copy then just fill in the form below.